When is jitteriness abnormal Doc? My 3-month-old baby has jitters, both when awake and asleep. He was born premature. He had jitters during the first few days when they said it was due to low blood sugar. He doesn't necessarily calm down when I nurse him. He starts being jittery in the morning when he wakes up, and even after he has been fed. I have tried both, breast-milk and the formula milk, and he reacts the same. His head measurements are normal. He grew up very fast during the first two months and was 400g overweight at three weeks. Since he got his shots, I noticed his jitteriness has worsened. Note he is jittery when he sleeps as well. I'm not on drugs and never have been. Thanks for giving me your opinion. I don't know if I overreact. Continuous jitteriness that you have described is certainly worrisome. Fine persistent tremors along with poor consolability indicate hyperexcitability. Babies of the mothers who indulge in recreational substances such as marijuana, cocaine, opiates and the like. You have clearly mentioned that you are not into recreational drugs, so I will leave that point for now. However, a similar picture could be seen also in the babies whose mothers are on certain prescribed medications such as for depression and asthma. Who would ever suspect chocolates? Most of us indulge in them. Most ice-creams, cookies, cakes, and drinks are topped with cocoa. No one doubts it. But yes, it is one of the causes of hyperexcitability syndrome in babies of chocoholic mothers. Infants of chocoholic mothers often present with jitteriness, irritability, inconsolable crying, excessive sucking, and sleeping difficulties. The symptoms start soon after birth and persist until cocoa intake is gradually stopped. Caffeine and theobromine (a caffeine-like substance) are the active ingredients in cocoa. Besides, some other of its constituents can mimic, directly or through a neuroactive compound in the brain, the effect of cannabis, marijuana, and hashish. Caffeine is found in coffee and cocoa beans, kola nuts and tea leaves. Though not categorized as a drug, it is the most commonly consumed stimulant. It is popular because it reduces fatigue, improves mood, and increases alertness. These very properties are the cause of hyperexcitability syndrome in babies of the mothers who indulge in excessive caffeine containing foods and beverages. How much caffeine is excessive? A cup of coffee contains anywhere from 80 to 175 mg of caffeine, depending on the quality of seeds used and the way the decoction is prepared. The recommended limit for all women of childbearing age, during pregnancy, and for the mothers who are breastfeeding their infants, is not more than 300 mg of caffeine a day. The breakdown and excretion of caffeine are hindered by high estrogens in mothers during these phases. Most birth control pills add to the natural levels of estrogen in young women. Caffeine is easily transported to the baby both through the placenta and mother’s milk, whereas its clearance from their body is very poor. Particularly so in the babies born preterm, newborns and infants below 6 months of age. It is one of the known cause of growth restriction of a baby in the womb, and premature birth. 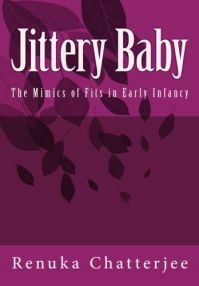 Thus the jitteriness in infants that is caused by high caffeine levels in their circulation is further accentuated by the low calcium levels in their blood. However, clinical evaluation by a pediatrician is always recommended.